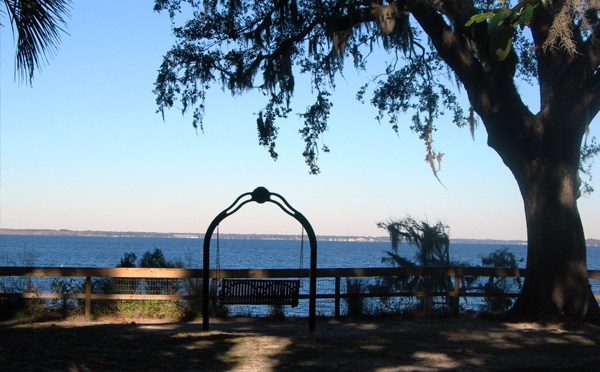 Alpine Groves Park spans 54.5 acres in Northwest St. Johns County between the St. Johns River and William Bartram Scenic & Historic Highway. 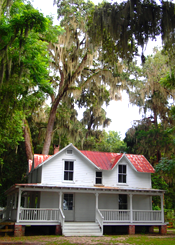 The many unique features for visitors of all ages to experience and explore include recreational activities, three unique Florida habitats, and historic structures. Picnic tables are conveniently located near the parking lots, along with an orange grove themed playground, bathrooms and outdoor pavilion. 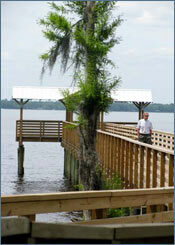 Visitors can access the St. Johns River by fishing pier and kayak launch. 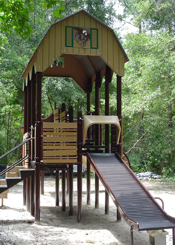 Hiking and exercise enthusiasts will enjoy the one mile paved handicap and stroller accessibile hiking trail that traverses three distinct Florida habitats. While exploring the park you can experience a variety of Florida flora and fauna. In the uplands, you'll find towering pines, gopher tortoises, and a variety of birds. Venturing towards the river, you'll leave the uplands and enter the mixed hardwoods, home to large live oak, hickory trees, and owls. Follow the flow of the fresh water creek as it opens into the St. Johns River and you'll find cypress trees, manatees and alligators. In addition to the native Florida ecosystems, you can also find two butterfly gardens maintained by the Garden Club of Switzerland and the Friends of Alpine Groves. There are also a variety of citrus trees planted around the park that connect the visitors to the park's historic roots. This site was an orange grove homestead during the booming 19th century citrus industry. There are three historic structures, including the Bennett House, a citrus sorting shed, and the horse stables, all of which are the last remaining physical structures in this area from the 1800s. Interpretation of these buildings provides a unique window into the rich local history and 1900s' economic development of northwest St. Johns County (Fruit Cove, Orangedale and Switzerland). If you would like to become part of the preservation of its history, visit the Friends of Alpine Groves Facebook page. Leashed dogs are welcome in County parks. Please remember to clean up after your four-legged friend. Educational field trips can be scheduled through the Parks & Recreation Department Naturalist, AyoLane Halusky at (904) 209-0348. To rent a covered pavilion or reserve a date for a special event such as a wedding, contact Joanne Machula at (904) 209-0328 or jmachula@sjcfl.us.